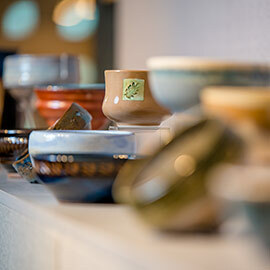 WATERLOO – Wilfrid Laurier University’s Robert Langen Art Gallery (RLAG) will host its sixth annual Empty Bowls charity event on the university’s Waterloo campus Thursday, May 12. The event will take place in the Senate & Board Chamber. Bowls created by the Waterloo Potters’ Workshop will be available for viewing in the former gallery space, located on the main floor of the John Aird Centre, from May 9-11, from noon to 3 p.m.
Tickets will be available for purchase starting Friday, April 1 for $40. Cash or cheque is accepted. Cheques are to be made payable to Wilfrid Laurier University. Tickets must be purchased in person from the Administrative Office of the Robert Langen Art Gallery, located at the Laurier Library, L324 (third floor) during regular office hours. Groups of eight can request to reserve a table. For more information, contact Suzanne Luke at 519.884.0710 x3801. The Robert Langen Art Gallery has played a vital role at Wilfrid Laurier University’s Waterloo campus since it opened in 1989. As Laurier’s visual arts centre, the gallery provides knowledge, stewardship, appreciation and enjoyment of Canadian art and culture to members of the Laurier community and beyond. The gallery’s annual programming complements concepts and theories in Laurier’s academic curriculum and integrates community outreach initiatives as related to the visual arts. In the spring of 2015, RLAG was integrated into the administrative structure of the Wilfrid Laurier University Library. A new gallery space is scheduled to open in the Waterloo campus Library in the fall of 2016.